Normally we limit the list of companies to the highest annualized total return candidates that also have a first or second quintile quality ranking. I made an exception in this case for Southwest Airlines (LUV) because of the forecast boosts in this week’s updates — earning LUV a spot on the Materially Stronger part of the update. 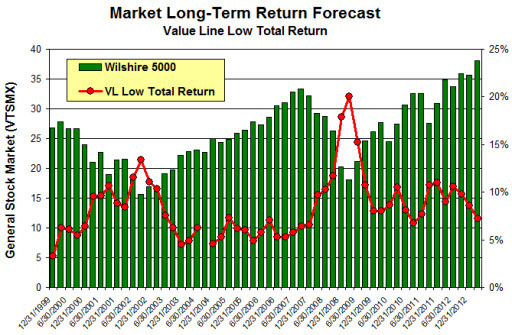 The Value Line low total return forecast is 7.2%, down slightly from 7.3% last week. Although we could face a correction near-term, no alarms are sounding on the New Highs vs. New Lows trend … suggesting that protective measures are not yet necessary. The S&P 500 relative strength index has relaxed back to 55.9 after recently being in the overbought (>70) range. Be selective and with MIPAR at 7%, select high-quality and bias overall portfolio quality and financial strength to the higher end of long-term target ranges.